In summary, I think although the acquistion of WHB is below valuation, the benefit of this acquisition can only be reflected in the earnings only in year 2017. By year 2017, I do believe there may be a bear run coming, and I am not willing to wait that long. 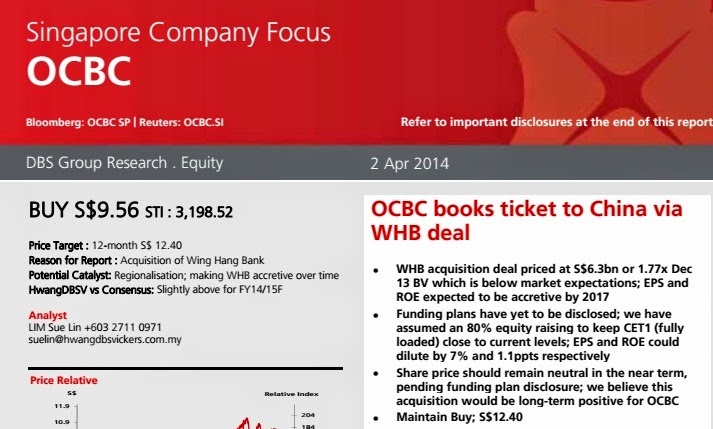 Temporarily, OCBC does have a strong short term resistance at $9.80 - $10. As local banks is still suffering from the local housing cooling measures, and with STI near our 3250-3300 resistance, we don't encourage you to look at this stock now. Perhaps there may be other better blue chips around like Singpost, whose acquisitions are already going to reflect on their earnings this year!